My recent adventure on the high seas (well, the North Sea to be precise) got me thinking about the numerous nautical idioms that permeate the English language. As an island nation, Britain has a rich maritime heritage. 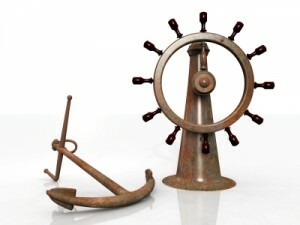 Our reliance on the sea for trading purposes resulted in a wealth of mariners’ lingo – much of which we still use today. However, over the passage of time the majority of these seafaring phrases and sayings have become metaphorical, with their original meanings long forgotten. I’ve added in links for some of these nautical idioms in case you’d like to learn more about their origins and etymology. Seafaring has also provided more than its fair share of false etymology. Contrary to popular belief, cold enough to freeze the balls off a brass monkey has nothing to do with a ship’s brass fittings, nor does the acronym POSH actually stand for ‘Port out, starboard home’. This collection of nautical idioms is by no means exhaustive. Which ones do you like best? Any that were new to you? If you’ve enjoyed these, do check out some of the other posts in my idioms series. I would think, “Everything is aboveboard,” is a nautical idiom. You’d think so wouldn’t you, but according to Phrases.org.uk the term originated in the gaming community: If card players keep their hands above the table (board) they can be seen to be playing fairly. I read that the saying did have nautical roots and meant to not hide your crew below decks as pirates often did to hide their intentions when approaching another vessel. Surprised not to see “change tack” even though you didn’t claim it’s exhaustive. Actually, the more accurate SPELLING is “anchors aweigh” ….weigh meaning hoisted out of the water.